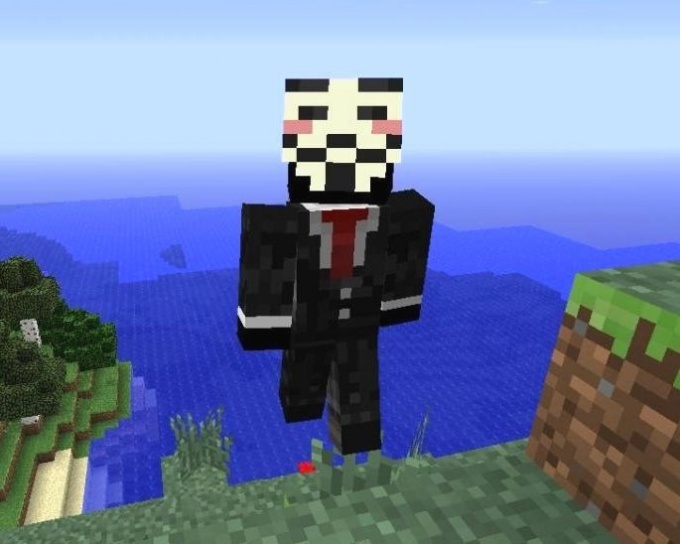 In Minecraft one of the most distinguishing features of any character is its appearance - skin. Thanks to him, the player recognizes what the mob is coming to him, threat or not. In this case, the gamer is often too wants his game character looks different from the others, trying to show through your skin own personality and internal qualities. If you are a happy owner of a licensed copy of the game to change skins, you will be incredibly easy. One click - and you're Superman, Mario, creeper, or another of your favorite character. In the case when you settle for a pirated game, try one of the very easy to implement methods to change the appearance of your hero with the "standard" boy Steve on something more useful and meaningful to you. Go to any website, where displayed not only characters, but also nicknames, to which they are attached. Their owners have a license account, and therefore have the opportunity to change the game's appearance at their own discretion. Choose among this variety of skins that you like. This can be a robot, a hostile mob, a comic book hero or your favorite computer games, multiperson, etc. in Fact, the specific choice - directly behind you. Pay attention not only on interesting to you skin, but also a nickname associated with it. Capture in memory all the nuances of his writing, until the underlining and other marks, if present. Don't confuse similar on writing numbers with letters (e.g. 0 and o) - in this case, these tiny details are essential. Ideally write down or even copy your desired nick. Go to the multiplayer online, where they plan to play. Even if you have already been registered previously, remember: you have to start the gameplay again (naturally, with the loss of all the achievements in it), because you'll need a completely different user name than what it was before. Call by pressing T the console (the same one where they write in the chat), enter a nickname that is bound to interest you skins, create a password and start playing. Don't be alarmed if the next time you visit above game the online when looking at your character you'll notice that his appearance has changed. This will mean only one thing: the owner of the licensed account nickname that you have used, changed skin. If you arrange such a metamorphosis, remain in a new guise. No - again, go to the website, where last time was looking for the option desired appearance, and find another nickname, bound to the same skins. Now preregistering on its multiplayer and online play, the gameplay is starting again from scratch. You must realize that to do such manipulations you will have every time the account owner whose nickname you borrowed, decide to change game appearance. If this prospect does not appeal to you, change the skin in any other way or think about purchasing a licensed version of Minecraft. If you prefer single player, you can try another method to install skins in Minecraft pirate. Save the file with the desired version of the game looks already on your computer rename it to char.png. Then open through the archiver minecraft.jar find a paper with the above name and delete it, replacing then on the newly created you - the one that contains the skin. However, in this case, your appearance will be visible only to you, but singleplayer this is not essential. Don't risk to try on Nicki known employees of Mojang (e.g., Notch or Jeb). Such actions can bring you serious trouble.